Nashik, October 27: Undertaking every possible efforts to make India strong, the Ministry of Defence is leaving no stones unturned. In a new attempt, the 11 Base Repair Depot (BRD) of the Indian Air Force at Ojhar in Maharashtra’s Nashik district on Friday handed over its first indigenously overhauled Sukhoi Su-30MKI fighter jet to the Indian Air Force. Sukhoi Su-30MKI is a twin-jet multi-role air superiority aircraft developed by Russia’s Sukhoi and built under licence by India’s Hindustan Aeronautics Ltd (HAL). The aircraft was handed over to the Operational Squadron of the IAF. 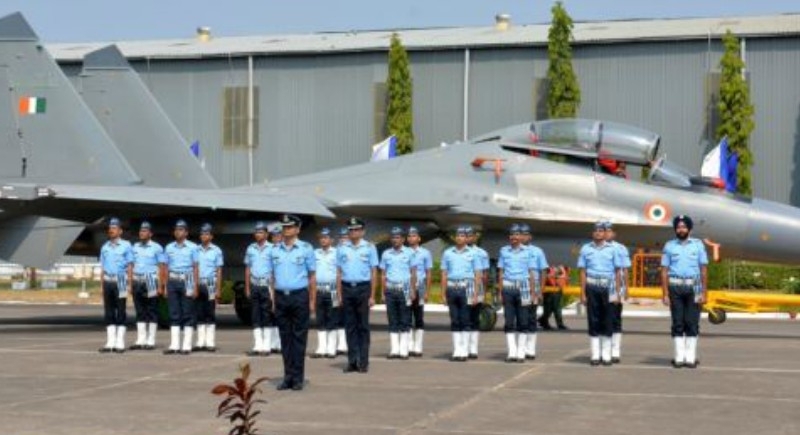 Air Officer Commanding-in-Chief of the Maintenance Command Air Marshal Hemant Sharma handed over the aircraft to Air Marshal H S Arora, Air Officer Commanding-in-Chief of South Western Air Command, at a ceremony held at the Air Force Station Ojhar, about 200km from Mumbai. The 11 BRD is the only fighter aircraft repair depot of the IAF and undertakes repair and overhaul of frontline fighters such as MiG-29 and Sukhoi 30 MKI. Established in 1974, the depot progressively built and improved the technical expertise and infrastructure over the years and by 1983 it had overhauled 100 Su-7 aircraft. From 1983 to 1988, the depot also undertook overhaul of MiG-21 fighters. Later, overhaul facility for MiG-23 aircraft was set up in 1986 and 248 jets were overhauled till May 2015. Overhaul of MiG-29 aircraft commenced in 1996. The upgradation of MiG-29 and repair and overhaul of Su-30 MKI aircraft is being undertaken at the depot. 11 BRD is the only agency to undertake overhaul of ejection seats and role equipment of Su- 30 MKI aircraft, both for the IAF and HAL. The first Su-30MKI overhauled by 11 BRD took off on April 24 and was tested for its airworthiness before being inducted for operational tasks in a flying squadron.